Cape Town - The Proteas' new T20 skipper Faf du Plessis admits he was surprised when asked to captain South Africa but says he's honoured to be picked for the role. The 28-year-old was on Thursday named to lead South Africa in the upcoming three-match T20 series against New Zealand, starting in Durban on December 21. Du Plesssis takes over from regular limited overs captain AB de Villiers - who will be rested for some of the T20 games. De Villiers will also not wear the wicketkeeping gloves, with young Lions star Quinton de Kock set for that role. And for Du Plessis, who also got engaged earlier this week, the appointment caps a truly remarkable month. He was the star on the Proteas' recent tour to Australia, where his 110 not out in the second Test in Adelaide helped South Africa pull off an unlikely draw which proved vital in the 1-0 series outcome. "Gary (Kirsten, Proteas coach) asked me after the third Test (against Australia in Perth) if I'd be interested in taking over from AB against New Zealand," Du Plessis told the Beeld website. "I was a bit surprised but it's a huge honour and I didn't hesitate for one moment. "The captaincy is definitely the cherry on the cake after an unforgettable month or so and I'm really looking forward to the challenge. "T20 games are probably the toughest type of cricket to be captain in because everything happens so fast and you have to think on your feet. 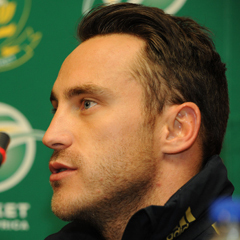 "However, I enjoy the challenge of trying to stay one step ahead of the opponent," said Du Plessis.